KHOTANG, April 2: When he took his wife in labor pains to Khotang District Hospital, Sanjeev Tilung Rai of Tuwachung Municipality-3 was asked to find some blood for surgery. However, as there is no blood bank, it became almost impossible for Sanjeev to find the urgently-needed blood. Fortunately, his blood group matched with his wife's and the surgery took place after he offered to donate his blood. “I was lucky. My blood group was compatible. Otherwise it would have been a nightmare to find the required type and quantity of blood,” he said. Kopila Rai of Kapilasgadhi Rural Municipality-5 was also recently admitted to the hospital in Diktel after labor pain. She too was asked to get some blood for the surgery. The family sought help from relatives but to no avail. At the end, they approached Nepal Army and fortunately, they arranged the required type and quantity of blood. These are only some representative cases. Hundreds of locals of Khotang district, who visit the district headquarters Diktel for treatment, are suffering due to the lack of a blood bank there. The patients are forced to manage blood from their relatives, acquaintances, personnel of Nepal Army and Armed Police Force, Red Cross Society, among other sources. It is especially difficult for pregnant women who come to the hospital for delivery. They are asked to find two blood donors before they are admitted. They use the blood when necessary, especially when there is excessive bleeding. When it is not used, the blood is returned to the donor. 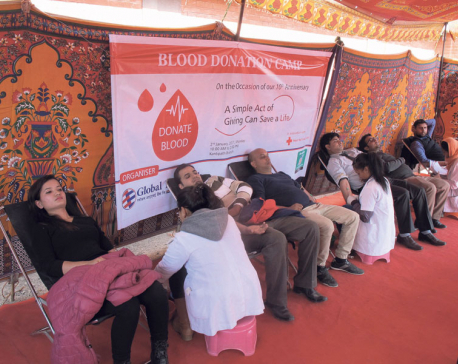 Many service seekers said they have faced extreme difficulties in finding a blood donor. Rita Rai of Rupakot Majhuwagadhi Municipality-5 was recently forced to suffer in the hospital's bed due to the lack of blood. For 15 hours, her relatives tried to find the required blood. At the end, they found a journalist who was ready to donate his blood. “How can the relatives of patients manage blood immediately? Finding the matching blood takes time. The task is especially daunting when the patient is in an urgent need of blood,” said Bhogen Ekle, a local of Nerpa, Rupakot Majhuwagadhi Municipality-6. “Perhaps it is difficult to establish a blood bank here due to financial constraints and lack of technical expertise. But it has to be done as soon as possible,” he added.